Since we have no time this morning to post a full Day 2 recap, mostly because we had no energy to write it last night after getting off the grounds at close to midnight last night and passing out shortly after returning to our hotel after a solid 10+ hours of music festing, here is a quick update on Day 2 and what we’re anticipating as Day 3 begins. The three highlights from yesterday were far and away Ohbijou, Tokyo Police Club and The Sunparlour Players. Delays seemed to hit all three stages, but Hillside tried their best to keep things moving. As a result, Ohbijou and Sunparlour Players appeared to have their sets cut short, while Tokyo Police Club was told at one point they had ten minutes left, then ten minutes later were told they had another ten minutes. Anyway, despite set delays, all three managed particularly tight sets and great performances. Pumpkin ice cream was again a highlight for Trina, and Sausage Brothers italian sausage and grilled corn on the cob was the height of the food fair. Also, the lineup to enter the festival was not nearly as long as it was Friday night, though arriving at noon might’ve had something to do with that. Leaving the festival was actually not as bad as anticipated, as we waited around in the VIP parking lot for about 20 minutes listening to the new Sunparlour Players album Wave North, giving the crowd a chance to clear, and our strategy worked out pretty well. There was one big dump of rain around 2, but surprisingly, given the forecast, the day was mostly dry. My phone battery died two tweets after that. Again, if you’d like to follow me at Hillside again, I’m @brianjpike. If you follow me just for this weekend then unfollow, I’ll understand, I promise. Today, Trina is most looking forward to Rural Alberta Advantage at 6 on the Lake Stage and Great Lake Swimmers at 7 on the main stage, while personally I’m kind of curious how Dave Bidini’s going to sound (Lake Stage, 3:00) and, as always, am looking forward to seeing Patrick Watson again (Main Stage, 8:00). 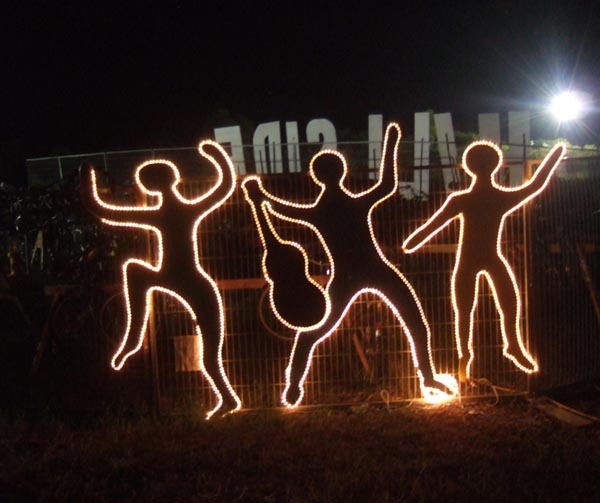 My partner Trina writes this post about Hillside’s environmental/sustainability initiatives during the festival. 1) Free shuttle bus from downtown Guelph. This takes a tonne of cars off the road. And given the lineup to get in via car on Friday night, this is a good thing for more than just environmental reasons. They also promote carpooling. 2) Massive bike lock-up area (that I believe is also manned). Even better than a bus. 3) No bottled water, water trucks on site provide it for free. I’ve seen other festivals do this (Sled Island in Calgary,for one), but Hillside was also advertising the closing-time of the water trucks so that campers could fill up for the night. 4) Reusable dishes. All food at Hillside is served on sturdy plastic plates, that are dumped after use into identified bins where volunteers wash ‘em up for re-use. Beer and beverages are served only in Hillside mugs, which are bought for $2.50 and used all weekend. I can’t imagine how much waste this cuts down. Brian and I also brought our own re-usable cutlery (when in Rome!). 5) Recycling AND composting. I saw bins for both available outside the food tent. 6) Solar-powered stage. The Sun Stage is small and used for spoken word acts only, but it’s a step in the right direction. My partner and co-press pass holder Trina contributes to this review. Her comments appear in italics. Hillside has a lot of charm. I’ve never been before, but I gather it’s grown a lot in it’s 26 years of existence. And while a certain part of me would like to complain about the drive to Guelph from Toronto during the early evening traffic, the very long lineup for parking and access to the site, the incongruities of us having to get our parking pass at the ticket tent past the people taking parking money (something we got around by me hiking up ahead of the car to the ticket tent, then hoofing it back to the car), and our resulting 8:30 arrival time, I’m just too damned charmed by this muddy, hippy, indie festival to really get irritated about any of that. We were promised complimentary mainland parking with our media passes, which comes with either a shuttle bus ride or a lengthy walk from the parking lot to the Guelph Lake “island,” but were given VIP parking right next to the entrance. A pleasant surprise that made up completely for traffic woes, so kudos to Hillside for that. Since we were too late to catch Donovan Woods (or any of the 7:00 starters, for that matter), first up was Coeur de Pirate. We arrived later than we wanted, but in time to catch the last half of Coeur de Pirate’s show. We walked in as my favorite Coeur song was just starting: Comme des enfants (which you can hear on our Panic@Hillside Playlist on Radio 3’s website). Coeur was great. Her reason for success: the ability to be completely adorable in that kitten-on-youtube kinda way while being absolutely classically beautiful. Lovely vocals. Show ended with a cover of Rhianna’s Umbrella-ella-ella, clearly a crowd pleaser. Coeur de Pirate does seem to have some magical ability to be utterly adorable onstage and come across as genuine. I can’t help but think of Melody Gardot, likewise a singer and piano player, and compare her set from the TO Jazz fest a few weeks ago, where practically everything seemed contrived. Also, one of Gardot’s songs came on the radio during the drive to Guelph. And she was singing in French. No comparison, really: Coeur blows her away. 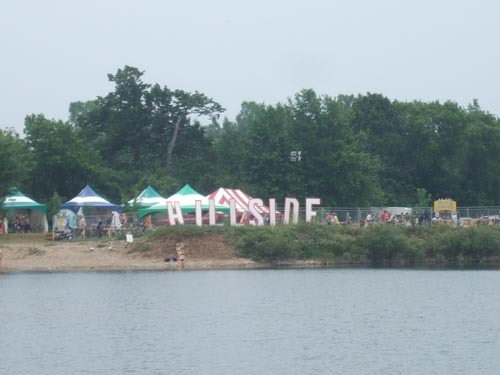 This weekend, July 24 through 26, is the 2009 edition of the Hillside Music Festival, taking place at Guelph Lake Island. Tickets are very nearly sold out, with only Friday night tix still available. 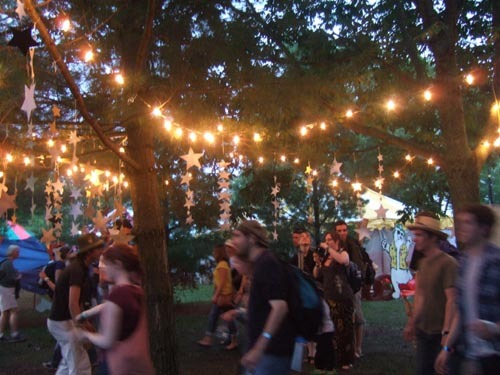 Hillside boasts an impressive lineup of mostly Canadian music acts, alongside a spoken word stage and a lengthy workshop schedule. If you’re not going, Panic Manual has you covered, as Hillside was nice enough to give us a couple of media passes. I’ll have some writing and reviews from Guelph all three days, and I might even provide some Twitter updates from the grounds if anyone’s interested (I’m @brianjpike). And if you are going, no, I’m not camping, and no, you can’t crash in my hotel room. You may have looked at the three-day schedule or the list of performers and thought “I sure wish somebody could give me some ideas about who to see. I don’t know who a few/some/many/any of these bands are.” I was once like you. Then I consulted with my partner and lovely companion Trina, who’ll be joining me at the Festival, emailed our resident indie Canadian music expert Wade, and listened to many samples from MySpace and CBC Radio 3. As a result, we have some “official” Panic Manual recommendations for all three days of Hillside. We also have a playlist on Radio 3’s website where you can hear all our recommendations, in chronological order of when they’re playing too (nice work, Trina), which you can find by going to radio3.cbc.ca and do a User Playlist search for “PanicAtHillside”, or just use this handy dandy permalink straight to the playlist.